Rising Electricity Bills, Not a Problem Anymore!! Chandigarh University has yet again proved its metal in Entrepreneurship world courtesy its Final year Mechatronics Engineering students who have come up with a pioneering idea of saving Electricity. 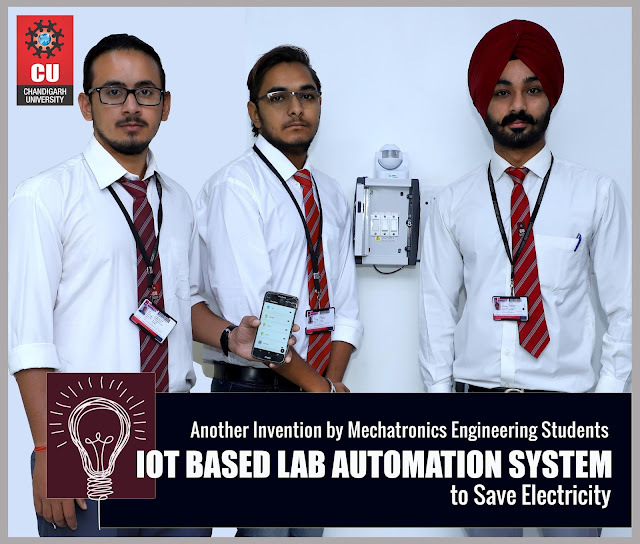 Kabir , Lokesh , Amarjot , Aditya and Suhani from University Institute of Engineering , Mechatronics Department have come with an IOT based Lab Automation System for saving Electricity. This Motion Sensor based Micro controller and Temperature indicator app has been named Swachalan and is available exclusively across Android servers. This particular innovation is a wifi model and can be installed either on the side walls or on the wall ceiling. With a downloadable size of only 3 MB , it saves electricity by as much as 50%. Mobile based operation and C based Programming are some of the other key features of this appreciable effort from students of Chandigarh University.